We listed up our recommendations for you ! MonotaRO offers Coaxial and more. You can buy them anytime from our Singapore online store. Material: Conductor / annealed copper wire, insulator / polyethylene foam, outer conductor / tin-plated annealed copper wire braid, sheath / vinyl Datsunamari, Color: Thin ash, Overall Length (m): 100, Inner Conductor (mm): Outer diameter / 1.05, Insulator Thickness (mm): 1.98, Sheath Thickness (mm): 0.95, Insulator Outer Diameter (mm): 5, Sheath Outer Diameter (mm): and (finish) 7.7 +/- 0.4, Caution: This product is manufactured in Japanese standards. Please check the specification before you order. Material: Conductor / electric for annealed copper wire, insulator / polyethylene foam, outer conductor / double-sided aluminum foil attached plastic tape + tin-plated annealed copper wire braid, sheath / PVC, CONDUCTORS AND ELECTRIC SOFT COPPER EXTERNAL CONDUCTOR / SIDED ALUMINUM FOIL AFFIXED PLASTIC TAPE + TIN PLATED SOFT COPPER BRAID, INSULATOR / FOAMED POLYETHYLENE/PVC SHEATH, Standard: JIS standard goods, Overall Length (m): 100, 100, Inner Conductor (mm): Outer diameter /1.05, Outside diameter /1.05, Insulator Thickness (mm): 1.98, 1.98, Sheath Thickness (mm): 1.0, 0.95, Insulator Outer Diameter (mm): 5.0, 5.0, External Conductor (mm): [First layer tape total thickness /0.05, aluminum foil on one side thickness /0.01 [The second layer] wire diameter /0.12 (standard configuration), a braided outer diameter /5.7, (di / number four, bats / 16) , [First] tape across thick /0.05, aluminum foil on one side thickness /0.01 [Second-tier] wire diameter /0.14(standard configuration), set od /5.8 Ed., (holding / four, scoring / 24), Sheath Outer Diameter (mm): (Finish) 7.7 +/- 0.5, (Finishing)7.7 +/- 0.5, Characteristic Impedance (ohm): 75+/-3(10MHz), 75+/-3(10MHz), Purpose: For VHF, UHF, BS, CS broadcasting receivers, For VHF, UHF, BS, CS broadcasting receivers, Caution: This product is manufactured in Japanese standards. Please check the specification before you order. Specification: 3 layer shield, 5C, Length (m): 100, Outer Diameter (phi mm): 7.7, Material (insulator): (Internal) polyethylene foam, Core Wire Diameters (mm): 1.05, Impedance (ohm): 75, Attenuation (dB): /100m(90MHz)5.8,(220MHz)9.4,(470MHz)14.2,(770MHz)18.9,(1300MHz)25.0,(1800MHz)31.0,(2150MHz)34.2,(2400MHz)36.4,(2600MHz)38.4, Caution: This product is manufactured in Japanese standards. Please check the specification before you order. Application: Indoor wire for TV broadcast reception. Interconnection between AV equipment. The drop cable or antenna feed line to the indoor., Overall Length (m): 100, Withstand Voltage: Between the 1000V / 1min, Outer Diameter (phi mm): External conductor /5.1 (double-sided aluminum foil affixed plastic tape), Material (Sheath): PVC, Material (insulator): PEF, Characteristic Impedance: 75+/-3(ohm), Static Capacity: About 56 (nF / km), Estimate Mass (kg/km): 63, Conductor Resistance (ohm/km)(20 degree c): 21.10 below, Insulation Resistance (M ohm/km): More than 1000, Sheath Color: Black, Insulator Outer Diameter (mm): 5, Sheath Outer Diameter (mm): 7.5, Conductor Diameter (mm): Internal conductor /1.05 external conductor /5.7, Number of Wires: 1, Material (conductor): Internal / AC external / TAC, Caution: This product is manufactured in Japanese standards. Please check the specification before you order. Weight (g): 50, Nominal Dimension (mm): 100, Dimensions A (mm): 106, Dimensions B (mm): 20, Material (Grip): Coil spring, Dimensions C (mm): 34, Purpose: Special tool for spin finishing of coaxial cables for TV antenna and peeling of the hull., Special tool for spin finishing of coaxial cables for TV antenna and peeling of the hull. Specification: Cable plug (crimp type), Dimensions A (mm): 23.3, Dimensions D (mm): 14.5, Surface Processing: Ni , Connection Type: Center / Crimp, external / crimp, Voltage Standing-wave Ratio: 1.2max. at DC to 2150MHz, Caution: This product is manufactured in Japanese standards. Please check the specification before you order. See more results of "Coaxial"
Find Perfect Coaxial Cable and Coaxial Cables For Your Need ! Coaxial Cable Connector and TL Flexible Tube and other special offers. Coaxial Cable and Antenna Plug and many other best selling products. Coaxial Stripper and Coaxial Cable Connector and other special offers. Coaxial Connector and Coaxial Connector Plug and other special offers. Our choice for you, Coaxial Cable 5D-2V and Coaxial Cable 3D-2V. Coaxial Cable 3C-2V and Coaxial Cable 1.5D-2V and many other offers. 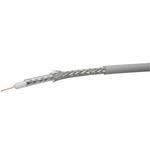 Coaxial Cable 5D-2V and Coaxial Cable 1.5D-2V and many other offers. BNC Coaxial Cable and 75ohm-Solid Type Coaxial Cable and other recommendations. Coaxial Test Leads and Both End BNC50ohm Coaxial Test Lead and other related products.